In a bold move to set the Moto Z apart from the staggering assortment of smartphones currently available, and to bolster its bottom line by selling higher profit margin accessories, Motorola has gone modular. Unlike LG’s approach with the G5 that requires the battery to be removed and the phone rebooted when swapping modules, Motorola’s Moto Mods attach to the back of the phone with strong magnets and are hot swappable. The modules are also tightly integrated with the software. Attaching a Moto Mod produces a small vibration and audible alert confirming that it has been automatically recognized. For any Mods with internal batteries, there’s a notification that pops up showing the charge level, which also appears in the battery section within the settings app and in the notification shade. There’s a dedicated “Moto Mods” page also in settings for updating the Mod’s firmware, managing its settings, and reading its instructions. 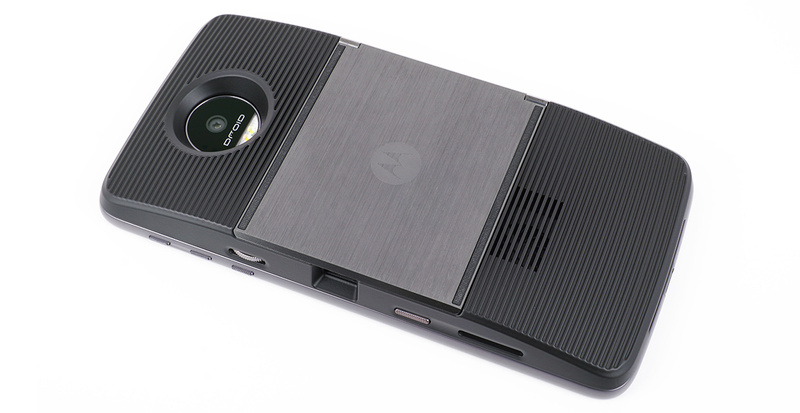 Regardless of what I think of the Mods themselves, Motorola’s execution of the modular phone is very good. The magnets hold the Mods firmly in place without making them too difficult to remove, the tight software integration makes them feel like they’re really part of the phone, and the ability to hot-swap the modules without rebooting or going through a setup procedure makes them convenient to use. My only criticism is that the metal pin on the back of each Mod and Style Shell that keeps them from sliding off the phone (it fits into a small hole on the back of the phone in the middle of the Moto Mod connector) can scratch the back of the phone if you’re not careful. So what about the Mods themselves? There’s three to choose from initially: the Moto Insta-Share projector, the JBL SoundBoost speaker, and a series of Power Packs that add an additional 2220mAh of battery capacity. The Power Packs range in price from $59.99 to $89.99 and come in several different designs, including a brushed black finish from TUMI, solid black and solid white from Incipio, and black and white stripes from Kate Spade. Each design comes in both a standard and wireless charging version, with the latter supporting the Qi 1.2.1 and PMA 3.0 standards. 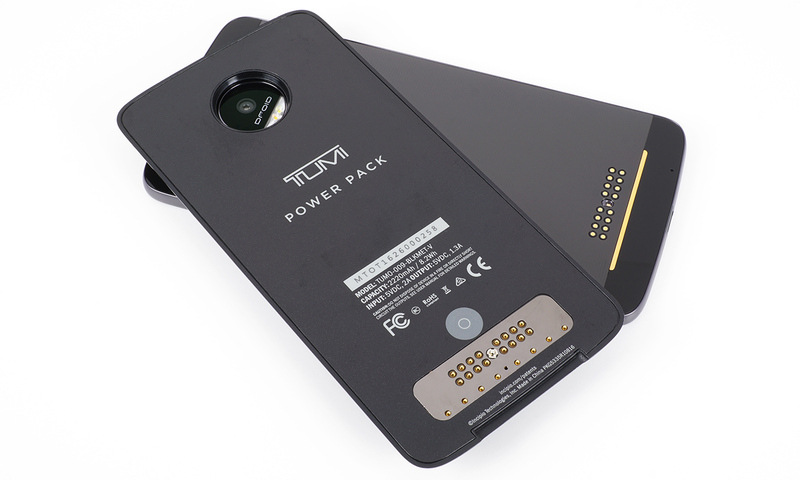 The Power Packs add an additional 6.2mm of thickness to the phones and either 79g of weight for the standard version or 85g for the wireless charging version. The Moto Z Droid wears the additional bulk well—it basically feels like a slightly heavier Moto X that fits in the hand comfortably; however, at a combined 13.2mm and 242g, the Moto Z Force Droid definitely weighs down your pocket. After attaching the Power Pack, it begins charging the phone’s battery and keeps it at 100% until it’s drained. There’s also an “Efficiency Mode” that’s supposed to increase battery life by up to 20% by only charging the phone once it drops below 80% instead of keeping it topped off. The standard Power Packs can only be charged while they are attached to the phone, but the wireless versions can be charged either attached to the phone or separately. I had no issues charging either Droid with Power Pack attached using standard 5W chargers or a Mophie external battery. The JBL SoundBoost speaker has two 27mm diameter drivers powered by up to 3W each. There’s a built-in aluminum kickstand on the back with a rubber foot that snaps out and props up the phone, and it also includes its own 1000mAh battery that provides an additional 10 hours of music playback (with the screen turned off). The speaker Mod even has a USB Type-C port for charging it separately from the phone. With a thickness and weight of 13mm and 145g, it creates a hefty package when attached to either phone that’s better suited for carrying in a purse or backpack than a pants pocket. 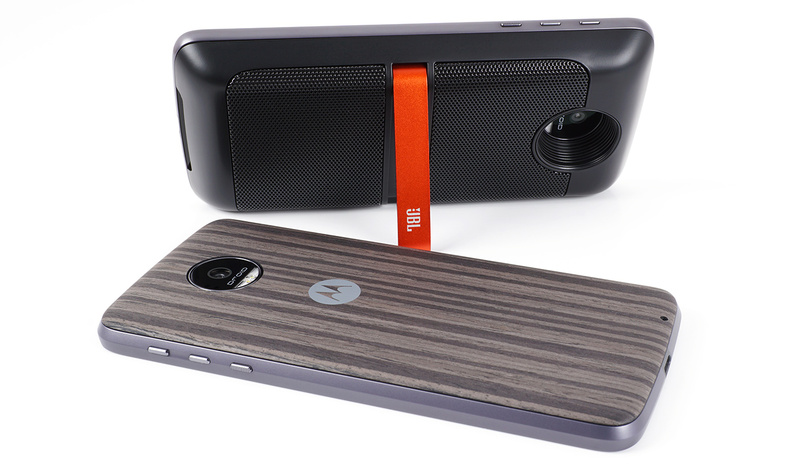 Its tapered sides blend in nicely with the Moto Z’s frame, and it actually feels comfortable to hold, although, your arm will tire quickly trying to hold this beast to your ear during a phone call; with this Moto Mod attached, it’s best to take advantage of the kickstand and leave the phone sitting on a table. The smartphone’s strength lies in its portability, so an add-on module that makes a phone less portable does not make a lot of sense. It makes even less sense when it costs $79.99 and provides rear-firing speakers that, while a significant upgrade over the Moto Z’s speaker, are easily bested by similarly priced Bluetooth speakers that can be aimed in any direction or placed anywhere within earshot. The only thing the JBL SoundBoost speaker Mod provides that a Bluetooth speaker does not is a kickstand for propping up the phone, which is not enough to justify its price and reduced mobility. The Moto Insta-Share projector Mod is a nicely designed accessory that succumbs to the laws of physics. At 11mm and 125g it’s just slim and light enough to carry around attached to the Moto Z Droid, but feels bulky on the back of the Force Droid. Motorola claims that its built-in 1100mAh battery adds 1 hour of projection time before using the phone’s battery. This gives the Moto Z Droid and Moto Z Force Droid an estimated 2.5 and 4 hours, respectively, of total runtime using the projector. The projector can be charged through the phone when attached or independently with the USB Type-C port on its side. Like the Power Packs, there’s a button on the backside that lights a small LED when pressed that indicates the charge level, a handy feature for quickly checking the battery status when it’s not attached to the phone. The module’s metal foot has rubber strips to help keep it from sliding around, and its hinge is stiff enough to hold the phone at any angle up to 90°. The projector’s controls are on either side of its lens—a power button, which has the same texture as the Moto Z’s, and a focus wheel, which is inconveniently placed directly below the phone’s power button, making it more difficult to use. The whole module is encased in a soft, rubberized coating. The projector itself uses DLP technology to project a 480p (854x480) image at 50 lumens nominal—bright enough for a darkened room or even indoors with a trace of ambient sunlight, but nowhere near bright enough for even a moderately lit room. Even with its relatively low output, the projector gets pretty warm during use and requires a small cooling fan that’s audible during quiet moments. 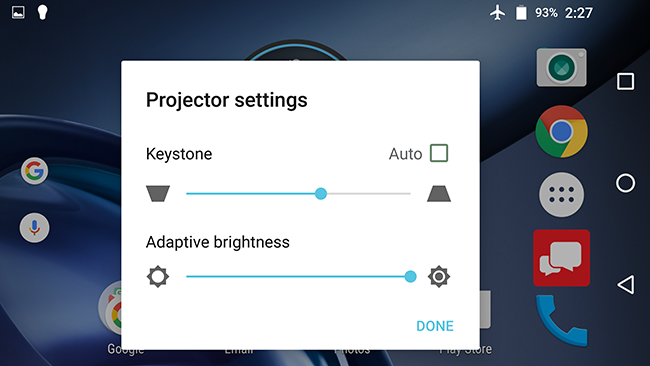 Tapping the projector’s power button when it’s turned on opens an onscreen menu for adjusting brightness and vertical keystone correction. Using the phone’s onboard sensors, it can automatically correct the trapezoidal distortion that results from projecting a rectangular image onto an angled surface at angles up to ±40°. Occasionally, I had to adjust for keystone manually, because the automatic correction would not fully compensate. Even in a completely dark room the image quality is not great. Downsampling the display's native QHD resolution to VGA creates obvious aliasing and jagged text. The projector’s 400:1 contrast ratio further limits the quality of photos and videos, where grayscale gradients are replaced by solid black fields. The Moto Insta-Share projector can handle an impromptu business presentation or entertaining the kids in a pinch, but it’s a difficult sell when there’s standalone pico projectors that perform better and cost the same or less than its $299.99 asking price. Is it really worth paying more for less performance just to have it attach to the back of the phone? Ultimately, Motorola’s modular platform will not live or die based solely on these initial Moto Mods, but on whether or not any other companies jump on board and develop additional modules with more unique functionality. For its part, Motorola seems committed to its platform, stating that current Moto Mods will work on future products at least one generation out. 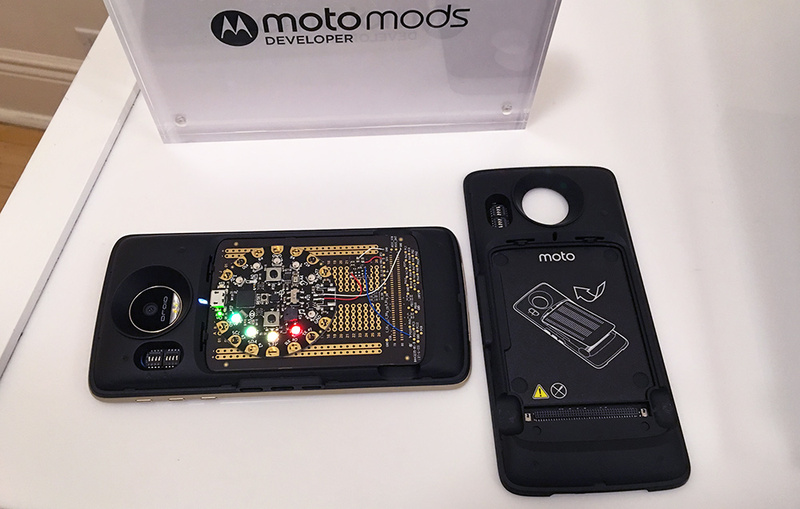 It also offers a Moto Mods Development Kit (MDK) that includes a breadboard, which fits into a reference Moto Mod, and a cover to enclose the circuitry. Motorola says additional Moto Mods are currently in development, and lists several intriguing possibilities such as secondary displays (either LCD or E Ink), printers, blood pressure monitors, or infrared cameras. Based on what I’ve seen to date, I’m still not sold on the modular smartphone concept. 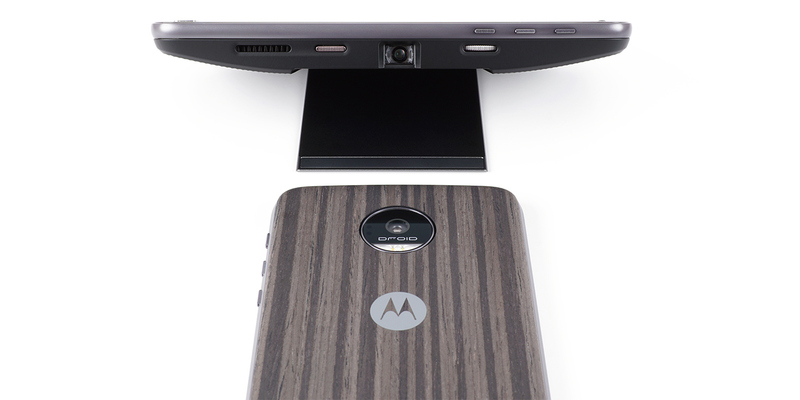 But Motorola’s Moto Mod system is the best approach yet, and there’s still a chance it may succeed.